This was one of the first ever Budget Bytes recipe experiments. 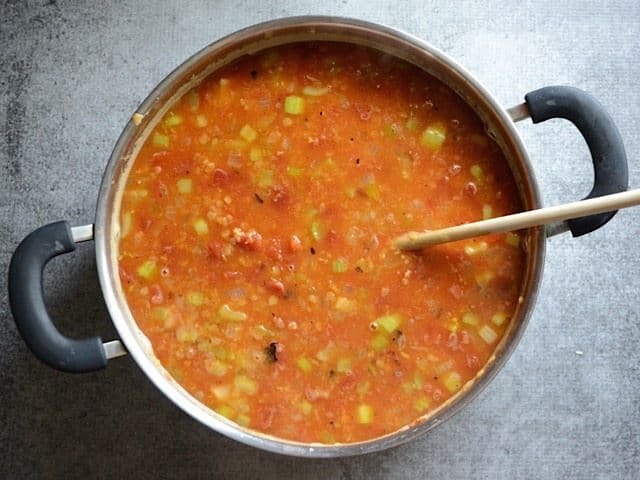 After browsing the internet looking for ideas, I saw this Spicy Red Lentil and Tomato Soup by Andrea Meyers and it piqued my interest. I changed the spices up a bit back in 2009, and increased them for a little more of a punch this second time around. I also reduced the liquid in this 2015 update because I wanted this Mexican Red Lentil Stew to be less soupy and more stew-like. The result is about 11 cups of a delicious stew, full of color, texture, and vibrant flavor. If you like my Chicken and Lime Soup, you’ll likely be a fan of this stew as well. I used the same technique of adding fresh lime juice and cilantro to finish the soup, which really brightens up the flavors. You can serve this with tortilla chips, or even a crumbled piece of cornbread. Both soak up the delicious broth and add body to the stew. This stew freezes great, so go ahead and make an enormous pot of this. Freeze half of it in single serving sized portions for those nights when you’re exhausted and don’t want to do anything more difficult than punch a few buttons on the microwave. 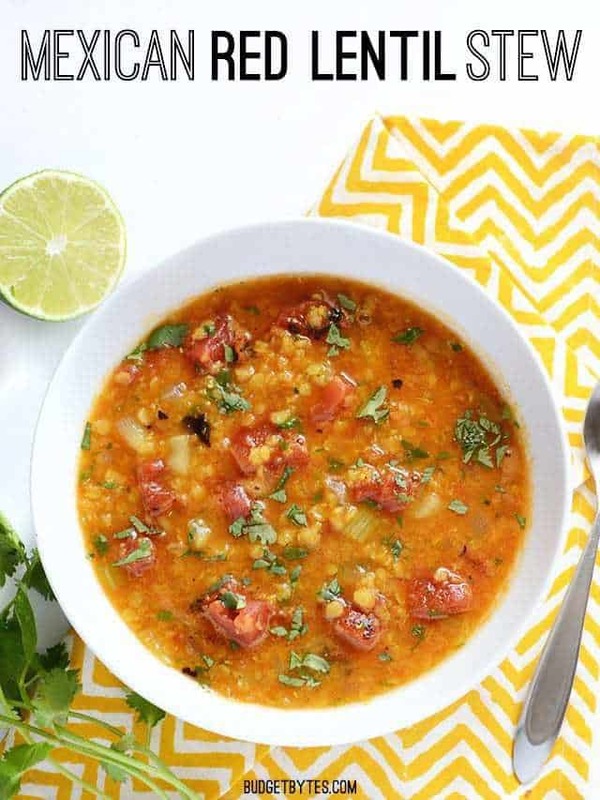 Smoky roasted tomatoes, fresh lime juice, and a handful of potent spices make this Mexican Red Lentil Stew anything but ordinary. Add the dry lentils to a medium pot. Cover with water, swish to rinse, then drain off as much water as possible. Repeat this process until the water remains mostly clear. After draining off the last rinse, add four cups of water, place a lid on top, and bring the lentils to a boil over high heat. Once it reaches a boil, turn off the heat and let sit with a lid on for about 20 minutes. While the lentils are cooking, begin the rest of the stew. Dice the onion and mince the garlic. Sauté both in a large pot with olive oil over medium-low heat until soft and transparent. While the onions and garlic cook, rinse and dice the celery. Add the diced celery to the pot and continue to sauté for a few minutes more, or just until the celery begins to soften. Add the diced tomatoes (with juices), chili powder, cumin, turmeric, and hot sauce to the pot. Stir to combine. The lentils should be finished cooking at this point. Drain off as much of the cooking water as possible, then add the lentils to the pot along with the vegetable broth. Stir to combine, then allow the soup to simmer over medium-low heat for about 15 minutes. The lentils will soften and break down further as they simmer, helping to thicken the stew. Pull the cilantro leaves from the stems, give them a rough chop, then stir them into the stew. Squeeze the juice of the lime into the broth and stir to combine. Taste the stew and adjust the salt or hot sauce if desired. 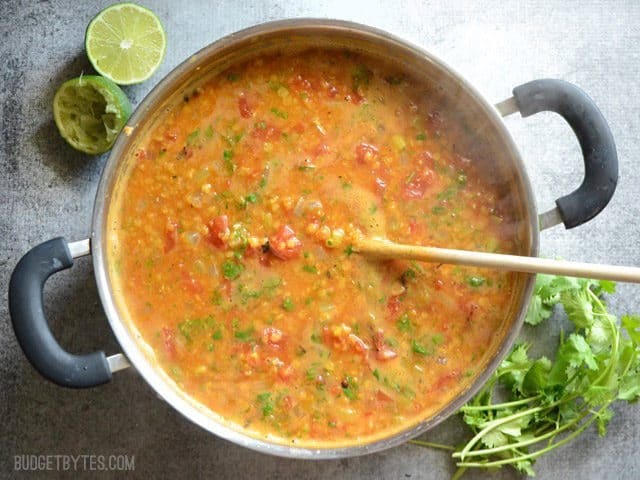 *The only red lentils my store had this time around were organic, so the price is roughly double what I paid when I originally made this recipe. **I use Better Than Bouillon soup base to make broth. 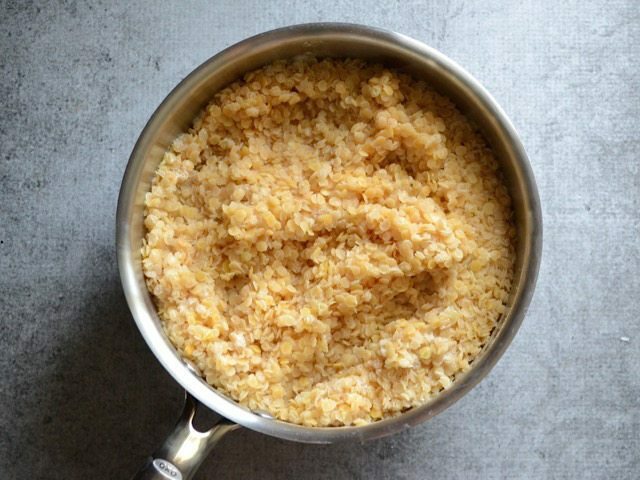 Red lentils differ from brown and green lentils in that they get very soft, lose their shape, and break down when cooked. 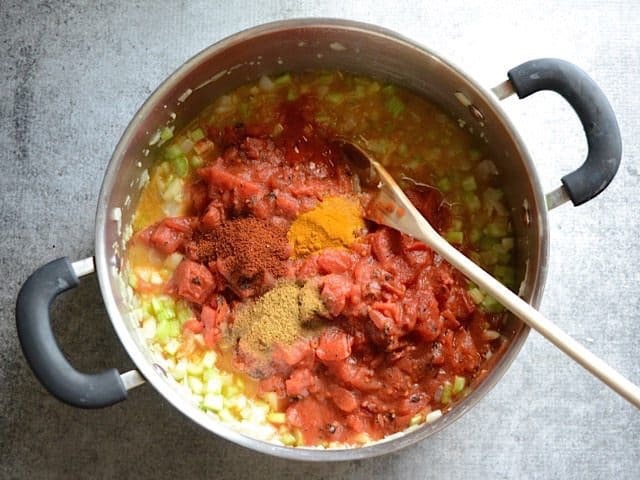 This is important to the stew because it thickens it and creates a unique texture. 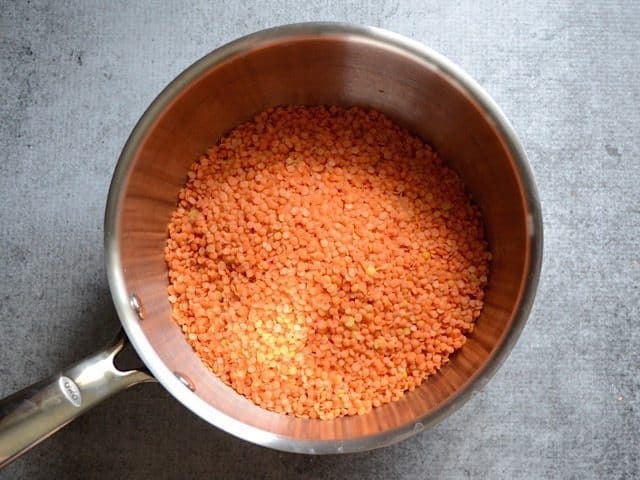 Place two cups of dry red lentils (about one pound) in a medium pot. Cover with water and swish it around to rinse the lentils. The water will likely turn cloudy. Carefully pour off the water and repeat the process until the water remains fairly clear. Once the last of the rinse water is poured off, add four cups of fresh water, place a lid on top, and bring the pot to a boil over high heat. Once it reaches a boil, turn the heat off and let it sit for 20 minutes to let the lentils soften. 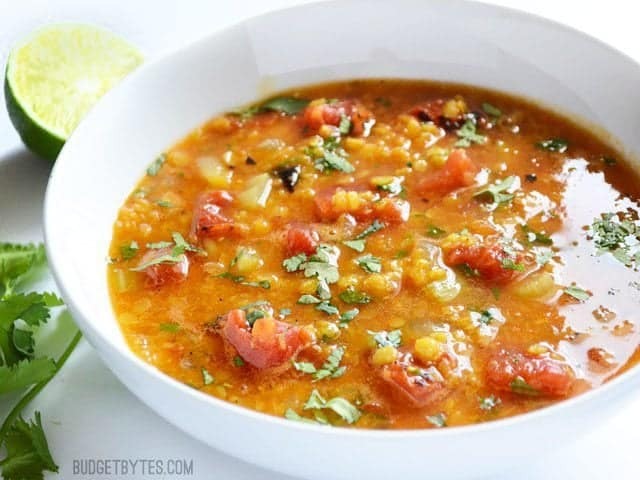 While the lentils are cooking, you can begin the rest of the soup. Dice one onion and mince four cloves of garlic. Add both to a large pot with 1 Tbsp of olive oil. 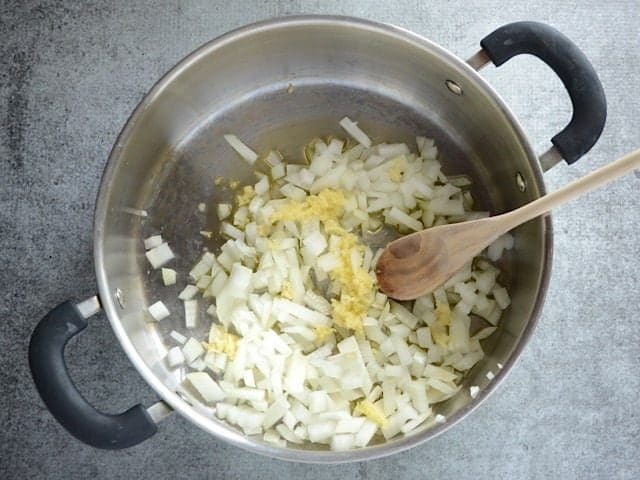 Sauté over medium-low heat for a few minutes, or until the onions are soft and transparent. 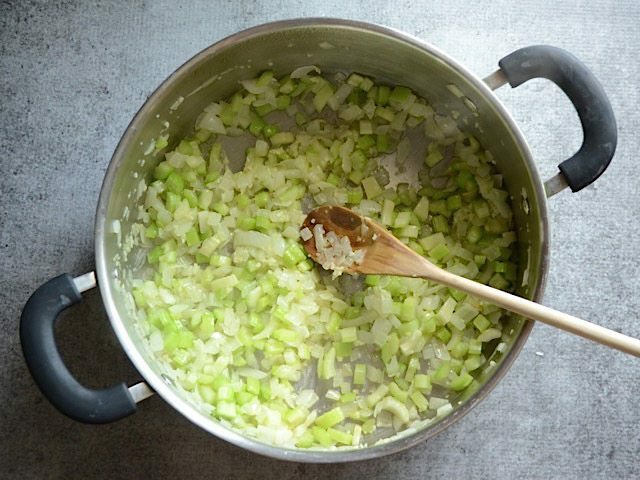 While the onion and garlic are sautéing, rinse and dice 3 to 4 stalks of celery. Add them to the pot and continue to sauté until they begin to soften (a few more minutes). Next add two 14.5oz. cans of fire roasted tomatoes (with juices), 1/2 Tbsp chili powder (NOT hot red pepper powder), 1 tsp cumin, and 1/2 tsp turmeric. Stir to combine. Also add 10-15 dashes of your favorite hot sauce. 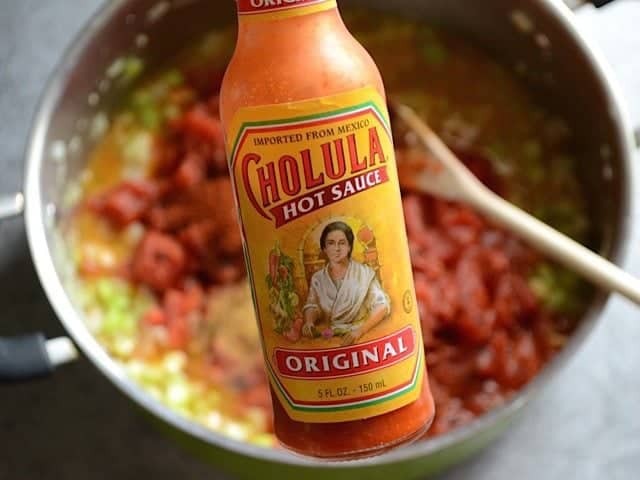 I happened to have some Cholula, so I thought that would be quite fitting. You can use Tabasco, Franks, or any type you like. I might be partial, but I even think sriracha would be interesting in this. By this time the red lentils should have soaked in the hot water for about 20 minutes and they’ll look a little something like this. They have absorbed most of the water, but there is still some pooled in the bottom. Carefully pour off the excess water, then add the lentils to the soup pot. After adding the cooked lentils, add 4 cups of vegetable broth. Stir the pot, then let it simmer over medium heat for about 15 minutes. This will further break down the lentils and help them thicken the pot. While the soup is simmering, pull the leaves from the stems for about 1/2 of a bunch of cilantro. Give them a rough chop. Cut one lime in half. 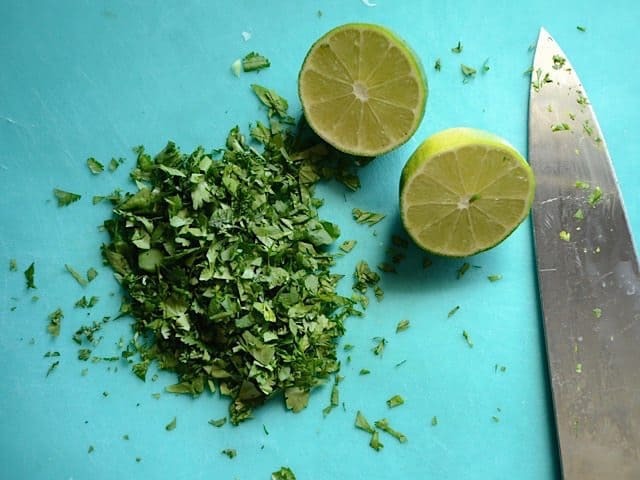 Stir the chopped cilantro into the stew and squeeze the juice from the lime into the broth (you can start with half the lime and add more if desired). Taste and adjust the salt or hot sauce if desired. This is one of those wonderful occasions when “healthy” and “delicious” coexist! Wow its great to see so many ideas to add to the stew, I can’t wait to make this wonderful stew in these very cold days, with avocado and queso fresco also. This is one of my favorite recipes! I freeze the leftovers in one cup servings and take them in my lunch. So good!! We have made this recipe twice and it does not disappoint! The first time, one or two ingredients were forgotten about. The second time, I didn’t have enough vegetable broth, so I subbed it with water. My inspiration to make it came from a Mexican Red Lentil Soup I had at a cafe for lunch. I searched online with the ingredients from the menu and this recipe was the closest match I found. It’s perfect! So delicious and easy. I used chicken broth instead of vegetable because that’s all I had, and it was so yummy. Oh and I ate it leftover with some spinach tossed in. Such a versatile soul. If I were to do this in the instant pot, would 15 minutes at high pressure be enough? I’m using the times for the split pea soup as a guide. I absolutely love this recipe! I’ve made it around 7 times now and each time is delicious!! I also add some chickpeas for protein and zucchini for extra veggies. I’m in love! Such a great, healthy, filling and flavorful recipe!! Amazing!!! I just made this tonight. I am vegan and recipes can be hit or miss. This was a hit! I added thinly sliced petite carrots as well. Thank you so much for posting! Thank you for this HEALTHY recipe. So refreshing to see a recipe that leaves out all the unhealthy stuff such as sour cream and cheese that tastes fabulous without them! I love this recipe! Will definitely make it over and over! Great leftover! I skip the cilantro but it has lots of flavour without it! Any suggestions for cilantro replacement? I’m one of the weirdos that thinks it tastes like soap.. I always think it tastes like Ivory Liquid Soap. Green onions sounds like a good, tasty substitute. This stew is delicious!!!! I used crushed tomatoes and steamed lentils from Trader Joe’s. I topped mine with a dollop of sour cream, fresh lime and cilantro. My husband is super picky and he was literally drinking from the bowl. Thanks for another winning recipe Beth! Sour cream took this to the next level! Great recipe Beth! This was delicious Beth! Thank you so much. I topped mine with a bit of Queso Fresco. Adding it to my list of favorites. 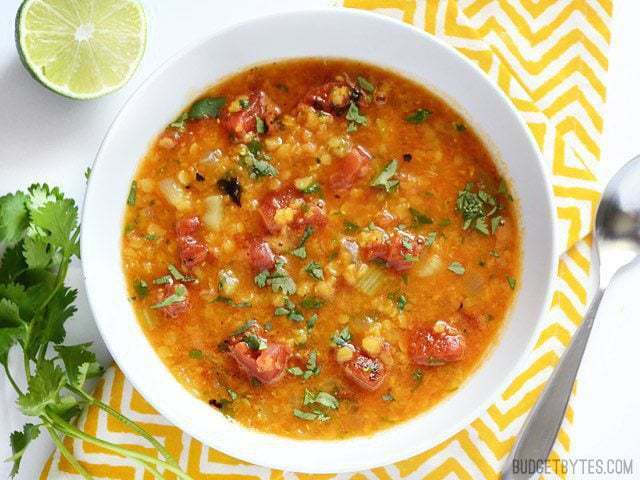 Made this with yellow split peas instead of lentils – the lime and cilantro really help keep the soup light and refreshing, perfect for these dreary winter nights. Diced avocado and a scoop of sour cream on top are also good ideas.